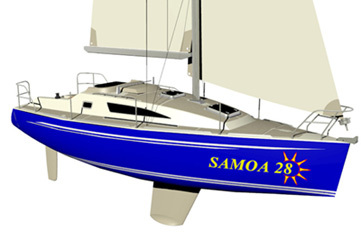 The Samoa 28 is a cruiser-racer specified for sandwich construction. To bring the process of construction within the reach of the inexperienced amateur builder, we defined for this boat the construction method called strip-planking sandwich. This method consists in building the hull with strips of wood or PVC foam over temporary moulds. This “planking” is covered with fibreglass reinforced with epoxy resin and then sanded and plastered in preparation for painting. After turning the hull upside, the moulds are removed and an internal fibreglass lamination is also applied over the bare interior. Next the structure and divisions are installed, the furniture is completed, and finally the superstructure is built, employing marine plywood covered with fibreglass. If P.V.C. foam is the choice for hull construction, the deck should also be built with this material. The completed boat is light and strong, and all phases of construction are of simple execution. We opted for an internal lay-out similar to the one adopted on the Multichine 28, which we consider the best arrangement for a boat of this size. A double berth is placed forward, going from the anchor chain locker bulkhead to the seats of the dinette. The saloon is comfortable enough for four persons to have a meal on the folding table attached to the mast pillar, or six adults to be entertained in this social area. The galley and the navigation station are placed at the boat's mid section, an area of maximum beam and better ventilation. The owners cabin is placed at the aft quarters with a double berth, clothes lockers, and a sofa to portside, and at starboard is located the heads. Abaft the heads there is a large bin to store sails and other boat gear. The gas locker is located at the starboard aft corner of the cockpit, and is only accessible by means of a lazzarete hatch inserted in the cockpit seat. Any eventual gas leakage is are drained through a scupper opening on to the transom wall. Above decks the Samoa 28 is an easy boat to be handled. The traveller, placed in front of the companionway hatch, doesn't interfere with the dodger, an important feature when cruising. The cabin trunk extending to the fore deck gives more headroom inside and provides the crew with a foothold when going to the fore deck. We opted for a 15/16-rigg to provide maximum safety when cruising, employing two pairs of swept back spreaders with single lowers. This configuration gives an immense rigidity to the mast, the larger genoa and spinnaker compensating for a lack of mast flexibility. On the other hand, when cruising, the mast is as rigid as a telegraph post, which, for peace of mind, is what most people want. But the Samoa 28 is a wolf in a sheepskin. Its lightness, together with a generous sail area and a very efficient bulbous fin-keel configuration, makes her a competitive racing yacht in club regattas. With her modern silhouette and her equal aptitudes for cruising and club racing, the Samoa 28 is destined to be famous in a very short time.